One thing about scar tissue is that it doesn’t tan like undamaged flesh. Spending time out in Italy has enabled me to see more clearly some of the injuries that life has inflicted. They have developed like a piece of chemical film. 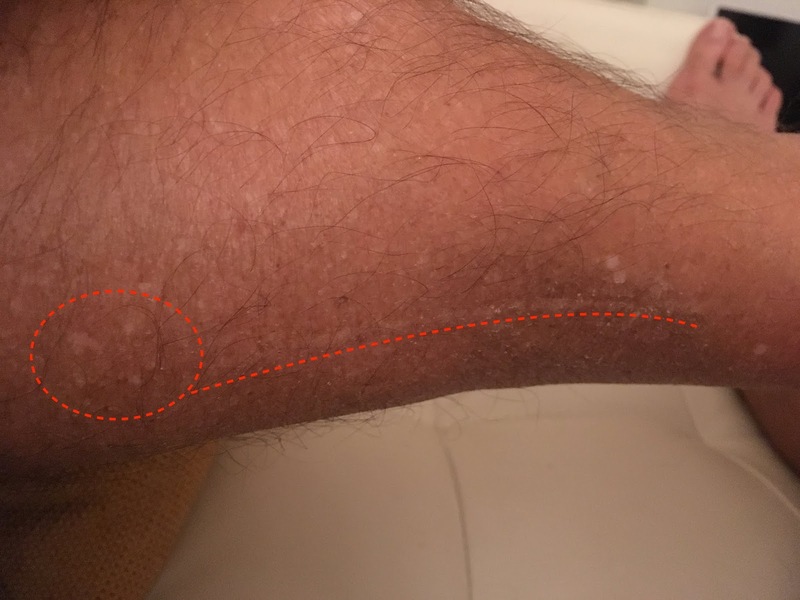 Looking down at my leg recently I was reminded of my mystery scar as indicated by the dotted line. The other scars I know about. My right, index finger scar is the result of over enthusiastic cleaning of a beaker in the chemistry lab at school. The scar on my middle finger on the left hand is a result of using a slippery Stanley knife (box cutter) while doing some tiling in the bathroom. The hernia operation scar hasn’t seen much sunlight, it is true, and so is still not very visible in all senses. But this scar I have absolutely no idea where it came from. About 15 years ago I was having a aromatherapy massage from a guy who previously specialised in sports injuries. He asked me about the scar tissue in my left leg. "Scar tissue!" I said "What scar tissue?" And he was right there is a scar about 5 inches long topped off by a rounded, damaged patch. I have no idea what injury caused this. Thinking it might be the result of some childhood accident that, like a carving on a tree had a grown with me, I asked my mother. She too denies any knowledge of such an injury! So, although it must have been painful at the time, at what age it occurred and what caused it I shall never know.